At the end of the last Congress, Reid needed someone who would aggressively push the Senate Democrats’ message when the stakes were highest. It’s a role the Nevada lawmaker doesn’t fill naturally, and he chose Schumer to be his top lieutenant. Since then, Schumer has targeted House Majority Leader Eric Cantor (R-Va.) in April’s continuing resolution debate, well before it was in vogue after last week’s Cabinet Room blowup. He’s also spearheaded the party’s message on corporate jet tax breaks in concert with the White House, and he even persuaded rank-and-file Senators earlier this month to abandon their desire for a Democratic budget so the party could focus on a tighter message of protecting Medicare and eliminating tax breaks for the wealthy. The current political climate, with intransigence in both parties on efforts to raise the debt ceiling, has just elevated Schumer’s platform. “He led the fight in the Senate against releasing our budget. He backed the idea that a budget paints a giant target on your back unnecessarily when it’s not going to pass anyway,” said one Senate Democratic aide not affiliated with a leadership office. There are a few problems with that last statement in bold, which is Democrats' current excuse for their inexcusable budgetary inaction. First, there's a little thing called "the law." Federal statute requires each chamber to pass an annual budget. 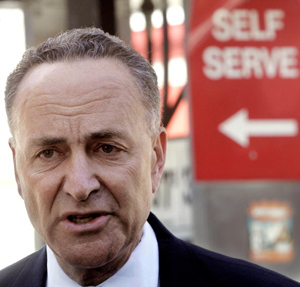 Schumer's scheme flouts the law and abdicates any attempt at good governance. Second, their political explanation doesn't wash, either. Democrats ask, "why should we bother to offer or pass a budget if the House won't pass it?" Beyond the fact that it's (a) their job, and (b) conference committees exist to resolve these exact issues, this rationalization does not explain Democrats' refusal to offer a budget in 2010, when they controlled both houses of Congress and the presidency. More than 800 days have elapsed since Senate Democrats last introduced a budget. Basic head math reveals that 812 days represents more than two full calendar years. "The House won't pass it!" might work as a flawed justification for the last 200 or so days of budget silence, but it does not explain the previous ~600 days. During that stretch, they could have introduced, and passed, anything their big bleeding hearts desired -- and Republicans couldn't have obstructed it, even in the Senate, because budget filibusters aren't permitted. Instead, they retreated into an election year shell, and chose to deny the voting public another chance to evaluate their (big) spending priorities. The truth is that Democrats haven't been interested in leading, or making "hard choices" for years. In 2009 and 2010, they were more interested in shoving massive spending bills down the American people's throats. In 2011, they've shifted their focus to demonizing, demagoguing, and defeating the proactive solutions offered by Republicans, hoping that they'll scare enough people into restoring them to full power, so they can revive their left-wing social engineering projects. Astoundingly, despite all this, Democrats still crown themselves the non-ideological adults in the room, and the media largely plays along. Chuck Schumer may be a sharp political tactician and a messaging guru, but the course he's charted reeks of policy loserdom and cowardice. The American people should reward his party accordingly.